In this article we explain how to do PWM (Pulse Width Modulation) control using arduino. If you are new to electronics, we have a detailed article explaining pulse width modulation. We have explained PWM in this tutorial using 2 examples which will help you learn how to control LED brightness using PWM and how to control DC motor speed using PWM. PWM control is a very commonly used method for controlling the power across loads. This method is very easy to implement and has high efficiency. PWM signal is essentially a high frequency square wave ( typically greater than 1KHz). The duty cycle of this square wave is varied in order to vary the power supplied to the load. Duty cycle is usually stated in percentage and it can be expressed using the equation : % Duty cycle = (TON/(TON + TOFF)) *100. 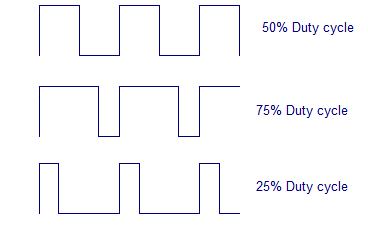 Where TON is the time for which the square wave is high and TOFF is the time for which the square wave is low.When duty cycle is increased the power dropped across the load increases and when duty cycle is reduced, power across the load decreases. The block diagram of a typical PWM power controller scheme is shown below. control signal is what we give to the PWM controller as the input. It might be an analog or digital signal according to the design of the PWM controller. The control signal contains information on how much power has to be applied to the load. The PWM controller accepts the control signal and adjusts the duty cycle of the PWM signal according to the requirements. PWM waves with various duty cycle are shown in the figure below. In the above wave forms you can see that the frequency is same but ON time and OFF time are different.Two applications of PWM control using arduino is shown here. Controlling the LED brightness using arduino and motor speed control using arduino. LED brightness control using arduino. This one could be the simplest example of PWM control using arduino. 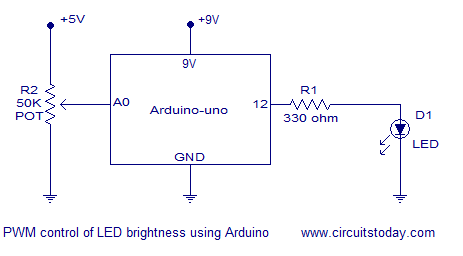 Here the brightness of an LED can be controlled using a potentiometer. The circuit diagram is shown below. In the circuit, the slider of the 50K potentiometer is connected to analog input pin A0 of the arduino. The LED is connected at digital pin 12 of the arduino. R1 is a current limiting resistor. The working of the program is very simple. Arduino reads the voltage at the analog input pin A0 (slider of the POT). Necessary calculations are done using this reading and the duty cycle is adjusted according to it. The step-by-step working is noted in the program below.